The game starts with one of the most incredibly energetic and hilarious narrations in gaming history. Will Stamper of Newgrounds fame provides an excellent voice-over telling the story throughout the game, in various cutscenes between the different worlds. In what could be considered the best narration since Bastion, Stamper adds a great deal to the game, which would definitely suffer if he wasn't in it. It obviously doesn't detract from the gameplay in any way, but it really does give the game something unique, and is definitely one of the most memorable aspects of the game. The story of BBT is about a group of friends, setting sail for an adventure, led by Hatty Hattington. All of a sudden, an insane storm takes the intrepid friends by surprise and dumps them on a strange island. Venturing inland, you start to glimpse cats, spying on you and hiding behind various objects. You eventually find Hatty, but he has been captured by these ominous cats, who are forcing him to wear a hat. Doesn't sound too bad, but that hat has mysterious powers, which instantly turn the once kindly gentleman into a gormless, eternally crying barbarian. And this is where the game starts. Hatty has taken you and all of the other friends prisoner, and forces you to complete room after room of puzzles, traps and cats. 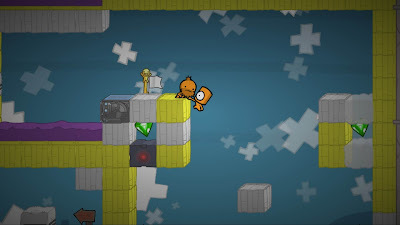 The gameplay is so familiar to anyone who has played any 2D platformer, which means that you can pick up and play the game instantly. The basic idea is that you must collect gems to unlock the exit. Three gems and you can exit, but to get a better grade you must find all of the gems, which can be any number up to seven, and for the perfect result, a golden yarn. Time is also taken into consideration with scoring, so completing the levels quickly will get you the very best grade available, A++. Playing the game is incredibly fun. It starts relatively easy, with a perfect difficulty curve, which really helps to improve your skills at a rapid pace. Towards the end of the game, you need perfect jump accuracy and quick reflexes to stand a chance at completing the levels, especially the final levels of each world, which also require you to race against the clock. It's a whole heap of fun, and can easily be played for hours on end. There are also a number of multiplayer modes in BBT, in both cooperative and competitive types. The coop story is probably the most fun mode in the entire game. 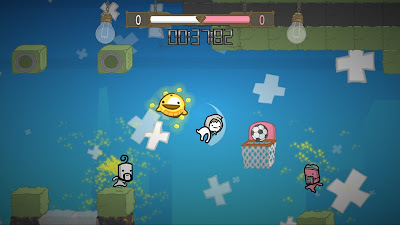 It features redesigned levels from the solo story, which are tweaked so that you have to take advantage of the moves only available for two players. The main examples of these moves are throwing your partner much further than they can jump, leaning over a ledge to offer a helping hand when they can't quite jump high enough, or throwing them high up in the air to reach the aforementioned high ledge. Working out what to do with a partner is just fantastic, and BBT definitely offers one of the best coop experiences for a long time. The Behemoth have done a great to job to ensure that the coop levels simply can't be completed by a lone player. Once you have completed a level, the gems and yarns will be added onto your total. You can then spend these at the prison gift shop. One of the great things about this game is that you don't have to budget your money. The gems can only be spent on prisoners, and the yarns can only be spent on weapons. It takes the stress and thinking out of buying items, as you know it doesn't matter what you spend it on, it's all the same. It's a feature that should definitely be in future games, not only from The Behemoth, but other developers. There are far more prisoners than you could wish for in a game, and the majority of them are awesome. Whether it be a prisoner with an octopus stuck to his face, or a pug, or just a happy guy, you will definitely have a few big decisions to make regarding your prisoner of choice. The versus modes are also a lot of fun, but in shorter bursts. Playing a mode for ten or fifteen minutes will provide many laugh out loud moments, but any longer and they seem to lose a bit of the appeal. One of the modes that I had most fun with was the basketball game. One vs. one, you must grab the ball that drops into the middle of the arena, and you are then tasked with throwing or dropping the ball into the other player's net. Playing this game with another player will most likely be one of the most hectic, nerve-racking gaming experiences you'll ever have. Hilarity will definitely ensue, particularly when you start using some of the weapons. I found that this mode was most fun when using the non-lethal weapons, such as the vacuum cleaner and the energy ball. One of the single greatest moments of gaming I've ever been a part of happened in this mode. My opponent had the ball and was running towards the open goal, with me in pursuit. With precision timing, I activated my vacuum cleaner, and try as he might, he simply could not outrun the power of the suction. Whilst it may not sound like a big deal, in the moment, when you really don't want to concede any goals, it was simply perfect. No game has made me laugh as much as this in as long as I can remember. There are many other versus modes too, such as King of the Hill, Colour the World, Grab the Gold and many more. They all offer a unique challenge and are all a lot of fun when playing with someone else. 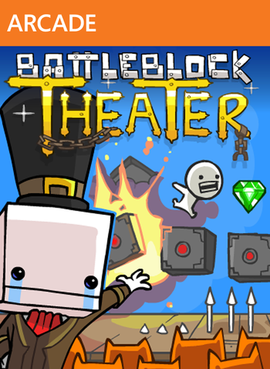 BattleBlock Theater is The Behemoth's masterpiece. The love poured into this game over the last four years is evident in this perfectly crafted platformer, full of puzzles, many deaths and more fun than you could possibly have anticipated. With equally amazing solo, cooperative and competitive modes, fun can be had in many different ways, and the overall quality of the game could give AAA retail titles a run for their money. The Behemoth have once again delivered a fantastic game like no other, and the world now has another game that shows just how much indie developers are in many ways creating the games that define our generation.